PAN is a 10 digit alpha numeric number, where the first 5 characters are letters, the next 4 numbers and the last one a letter again. These 10 characters can be divided in five parts as can be seen below. 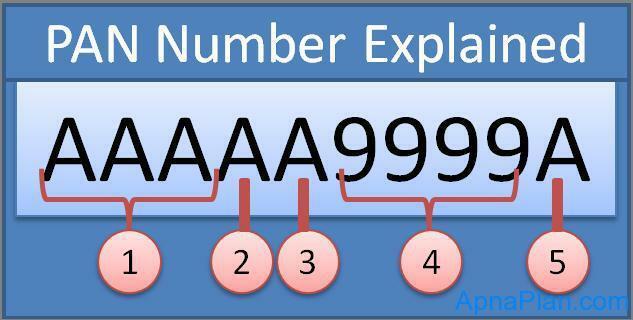 The meaning of each number has been explained further. Fourth character of PAN represents the status of the PAN holder. Fifth character represents first character of the PAN holder’s last name/surname. Next four characters are sequential number running from 0001 to 9999. Last character in the PAN is an alphabetic check digit. How to know if any complaints and cases running on the PAN card number? Now from Internet we can get to know every thing about our pan card, we can check ourpan card status online easily.